I hope that you and your family have had a wonderful Christmas season and a Happy New Year. I am grateful to be back in Olympia to serve you and continue to fight for common sense policies that move our state forward. My colleagues have elected me to a leadership position within the Caucus. I will now be the Majority Whip. Please click here to read a recent press release about my duties. This legislative session, the state must deliver a two-year balanced budget that meets the needs of everyone in our state. Since our last budget, 2015-17, the state has seen revenues increasing at unprecedented levels, without raising taxes. The latest forecast indicates a 12.2% increase, the highest in over a decade. Put another way, the state will take in $4.2 billion more revenue that the previous budget. That is good news because we have many important areas, such as our education system, that need investments. However, experts caution that this impressive growth in our state will not last and we must be good stewards of those funds. In early December the Governor unveiled his budget proposal. It was shocking. Again we see a lack of leadership and priorities in his proposal. He funds pet projects and campaign promises first, and increases taxes to fund education last. The governor’s proposed budget uses gimmicks and massive tax increases on small businesses, in addition to new income taxes on capital gains to meet our state’s paramount duty. The result is $4.4 billion more in taxes this budget cycle and over $8 billion when fully implemented. To put that in perspective, his proposed tax increases are more than all state property and business taxes combined. As a member of the Senate’s budget committee, Ways & Means, I will be working to ensure that our state lives within its means. We cannot afford to solve every problem endlessly raising taxes on our state’s citizens. Like a budget at home, we must live within our means and make tough choices by prioritizing and doing things differently. 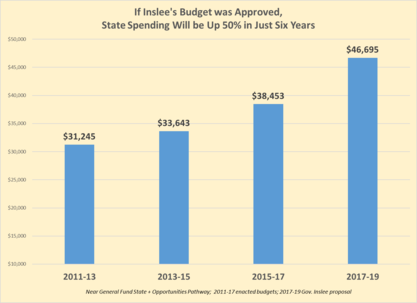 The new chair of the Senate’s budget committee recently sent out a policy newsletter about a portion of the Governor’s proposed budget. Over the summer, the governor negotiated state employee contracts in secret and committed Washington to spend nearly $2 billion on pay raises. Investing that money in our children should be a higher priority. Another challenge with these contracts is that the Legislature cannot change them. It can only vote to approve or reject. Looking back at recent history, Governor Gregoire, facing a smaller budget deficit, declared that collective bargaining agreements at the time were not financially feasible and sent negotiators back to the table. Please click here to read the recent policy newsletter, Economic Sense, that dives into the data and examines opportunities that will be lost if we fund these agreements. Do you know others who live in our district who may not be receiving my e-news updates? Please feel free to forward this e-mail invitation to them or click on the share button below. You can also read previous editions of my e-newsletter by visiting my website and clicking the NEWS tab.